And so here is a list of 7 such hits. To my American readers, I encourage you to look past the tackiness of each video; after all, it's Christmas (and all of these songs are from the seventies and eighties). 1. Merry Xmas Everybody, by Slade. Released in 1973, Slade's most famous hit has become something of an anthem among the British public at Christmas, and is widely heralded as the song that invented the race for the Christmas number 1 single! However, Merry Xmas Everybody failed to make a splash in the United States and, as such, is virtually never played on American airwaves. For my American readers, here is the popular rock anthem in all its wonderful glory. Like Slade, the long bearded members of the glam rock band Wizzard scored a huge Christmas hit with their song I Wish It Could Be Christmas Everyday in the 1970s. Since then, the song has become one of Britain's most beloved Christmas songs and has featured in what seems like every Christmas-themed British movie or TV show at some point or another. But, despite its popularity, it is pretty much unknown in the United States. When this song first hit the record stores in the UK in 1988, it actually performed quite poorly in the charts. However, standing the test of time, Chris Rea's Driving Home for Christmas is that song Brits love to hear while they're... well... driving home for Christmas. But, with the exception of the occasional airplay stateside, the song is about as well-known in the United States as Rea himself. Love him or hate him, Cliff Richard has surely reserved his place in the history of British Christmas music with his 1989 number 1 hit Mistletoe And Wine. While the video, and indeed the song itself, veer heavily on the cheesy side, Mistletoe and Wine nonetheless gets Brits in the mood for Christmas. However, despite the song's blatant Christian themes, it has failed to enter the collective American conscience. Perhaps equally cheesy is Shakin' Stevens' delayed Christmas hit Merry Christmas Everyone. I say delayed; it was released a year after its intended release date due to a potential clash with Band Aid's Do They Know It's Christmas? While the latter continues to gain airplay in the United States, Merry Christmas Everyone is largely unheard of. One of the less upbeat Christmas songs, Lonely This Christmas - a 1974 hit by British glam rock band Mud - is a popular tune at this time of year in the UK. With a lead singer who sounds and looks like Elvis, Mud were inspired by American music of the 1950s. Strange, then, that their famous Christmas hit didn't reach the same levels of popularity in the United States, where it is seldom ever played. 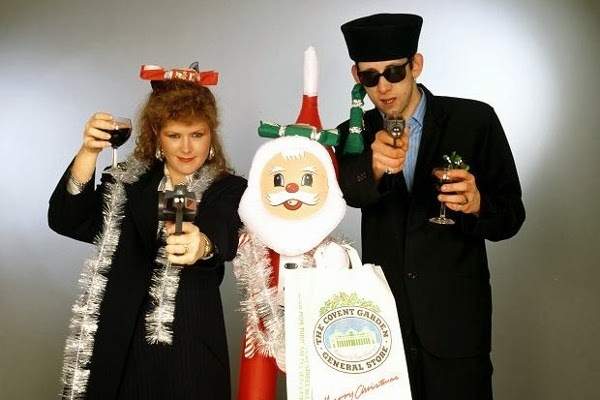 Widely regarded nowadays as Britain's best Christmas song, Fairytale of New York by the Pogues and the late Kirsty MacColl is one of those heartwarming hits that really gets you in the mood for the festivities. And with New York in the title and a distinctly Irish sound to it, you'd think Fairytale of New York would be "eaten up" in the United States. While it does occasionally get airplay, it is no way near the hit that it is in the UK. Laurence is a British expat living in Indianapolis, Indiana. He is a contributor for BBC America and has written for Anglotopia. In addition to his expatriate musings, Laurence is a keen composer of orchestral music. 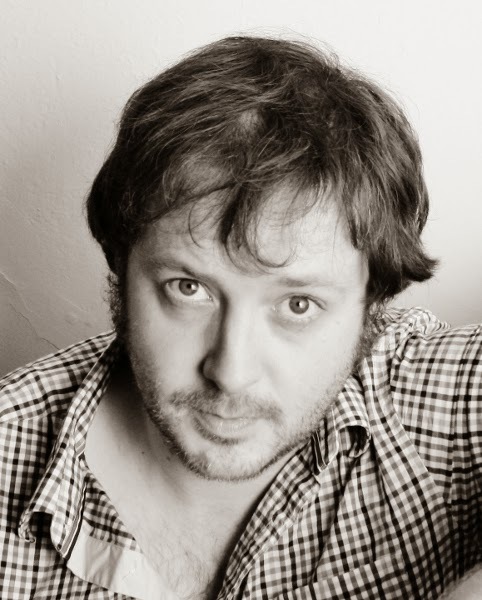 To hear Laurence's compositions, follow him on SoundCloud. I am American, age 50, and I have never once heard any of these songs. I can imagine #4 might be played on a Christian radio station (but I don't listen to that stuff) but the rest all sound way too "Euro-pop" to my ear which I think most Americans don't care for. With the exception of The Pogues I have never heard of any of these singers. "When Santa got stuck up the chimney" is unknown here. I have #7, but I may have come across it through a "If you like The Dropkick Murphys" kind of thing. American, born and raised, 49 years old. Except for the Mud song, I think these are wonderful. I get sick to death of the songs on the radio because they play the same things over and over. It's nice to hear something new. Do Americans know Stop the Cavalry by Jona Lewie? I would add The Snowman to this list. Don't forget about the American in the Pogues video .....a certain Matt Dillon ! Estoy muy de acuerdo con el punto de que las relaciones fuertes con sus clientes es la clave , y utilizar el lenguaje a sus clientes usar . Estos dos puntos son los principales puntos clave que tenemos que centrar en B2B Marketing. For me Christmas doesn’t officially start until they play "Fairytale of New York" on the radio. I get goose bumps every time. Kirsty MacColl had one of the greatest voices in British pop music. And Chris Rea never seems to get home for Christmas. I live in Norway where all the songs on this list are played every year. You somehow managed to forget Mel Smith’s and Kim Wilde’s hilarious “Rockin' Around the Christmas Tree”. Keep up the good work! I'm surprised that Lily the Pink wasn’t on here! Paul McCartneys brother and all lol! After living in the US for many decades I can say. with a fair amount of accuracy, that Fairytale of New York is not popular here for the following reasons: its cynical, its unintelligible, the bits you can hear contain bad language, it contains no "Christmas spirit" and you can't sing along to it. Summed up: its a real downer! I have never heard any of these songs before (and don't necessarily want to hear them again!). Love you blog! At Lowe's, where I used to work at, the music played overhead is powered by Muzak. We were lucky enough to hear Merry Christmas Everybody. Until I googled the lyrics, though, I didn't know the title of that song because it virtually never gets played on regular radio here. The cover we heard at Lowe's was likely the one by the Spice Girls. If not the Spice Girls it was Girls Aloud. I liked that one better than the original by Slade. As for these others, I've never heard of any of those, but I might recognize them if I'm lucky enough to once again work at a place that uses Muzak, as they play songs that you don't hear on regular radio. That's what I like about Muzak. Merry Christmas Everybody can't be found on American jukeboxes. You have to go to Youtube to hear it. You should talk to your local radio station about playing these songs. American radio stations have WAAAAAAAAAYYYYYYYYYY too much repetition. If any of these songs test well in Indianapolis they just might play everywhere here. But please persuade your station to play the Spice Girls cover of Merry Christmas Everybody rather than the original by Slade. At Lowe's, where I used to work at, we got our music from Muzak. As such we heard songs that never or almost never get played on regular radio. That was a real treat. It was at Lowe's that I first heard Merry Christmas Everybody. The cover that we heard, though, was probably the Spice Girls. If not the Spice Girls, it was Girls Aloud. That version was better than the original by Slade. I've never heard of these others. You should talk to your radio station about playing all of these songs in Indianapolis. Once they get played there they just might get played all across the United States. Radio stations here have WAAAAAAAAAYYYYYYYYYY too much repetition. It's nice to hear something new. I'd like to hear all 7 of these songs. But I'd like the cover of Merry Christmas Everybody to be the one by the Spice Girls. That cover is a lot of fun- just like a roller coaster. You just can't find that song on American jukeboxes. Every American Whovian should at least know the first one. It has been used 5 times in Doctor Who! "Fairytale of New York" is by FAR the best Christmas song there it ... no competition.